Singapore’s healthcare system aims to deliver quality and affordable healthcare services to all Singaporeans, regardless of age or socio-economic status. We continuously tune our system to deliver on our mission and, over time, have evolved our healthcare system into one that has served our needs well and is internationally recognised as one of the best in the world. The World Health Organization ranked Singapore 6th out of 191 countries on overall health system performance in 2000. In 2012, the World Health Organization ranked Singapore 1st for infant mortality rate, 2nd for maternal mortality rate and 9th for life expectancy at birth. These outcomes have been achieved with a national healthcare expenditure that is less than 4% of GDP – the lowest among developed countries. The cost-effectiveness of Singapore’s healthcare system stems largely from a strong emphasis on shared responsibility between the government and users of the healthcare system. Public subsidies go alongside co-payment by patients that vary according to their means. The government’s role is to assist those who are less able so that healthcare services are affordable to all, including the poorest in our society. These principles have guided us to evolve a financing system with multiple tiers of protection. Universal health coverage is provided by tax-financed government subsidies available to all citizens at public hospitals and government polyclinics. Co-payments are differentiated by income as well as choice of wards with different physical amenities. The second level of protection takes the form of Medisave, a compulsory medical savings account scheme for each Singaporean which can be drawn on to pay for their share of medical treatment. Medisave also serves to allow families to save up for their future healthcare needs, a large portion of which will materialise in post-retirement years. The third tier of support is provided by the national basic insurance schemes, MediShield and ElderShield: MediShield risk-pools premiums paid by Singaporeans to provide protection from large medical bills, while ElderShield protects against long-term care expenditure in old age. Finally, there is also an endowment fund, Medifund, which provides the ultimate safety net to ensure that no Singaporean is denied basic healthcare because of an inability to pay. Medifund covers not just those with lower incomes but also those who earn more but face large bills relative to their income. These multiple tiers of financing ensure a progressive healthcare financing system where government subsidies go to the poorest in society. Our financing system acknowledges that there is no free healthcare, and there is a need to co-share the burden of financing across individuals, employers, government and Voluntary Welfare Organisations (VWOs) in an equitable yet sustainable way. This has allowed us to achieve outstanding results in delivering good quality and affordable basic healthcare to all Singaporeans. Singapore’s current healthcare priorities are set out in our Healthcare 2020 Masterplan that will guide us in building an inclusive healthcare system for the future. The three strategic objectives in Healthcare 2020 are enhancing accessibility, quality and affordability of healthcare for our people. We will improve the integration of care by setting up centres that bring together doctors, nurses, and allied health professionals in one place. This will enable us to deliver care in an integrated way in the community so that patients can benefit from better care that is nearer to them. Our healthcare system has served the needs of Singaporeans well and kept healthcare affordable while delivering good health outcomes, with a recent Bloomberg study ranking Singapore the world’s healthiest country. We will continue to invest and improve our healthcare system, and refine our policies to respond to Singapore’s changing healthcare needs. The name ‘Singapore’ derives from the Sanskrit Singa Pura (‘City of the Lion’). 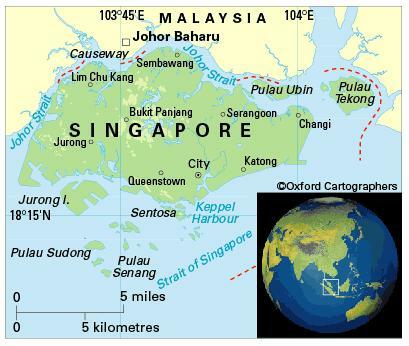 Situated in South-East Asia and lying just north of the equator, the Republic of Singapore is separated from Peninsular Malaysia by the narrow Johor Straits (1 km wide), crossed by a causeway. A number of smaller islands are included within its boundaries and a few kilometres to the south are islands belonging to Indonesia. A hot and humid tropical climate, without defined seasons. Heavy showers November to January. The most significant environmental issues are industrial pollution and seasonal smoke/haze resulting from forest fires in Indonesia; and the finite land and freshwater resources to support a very high population density. 5,303,000 (2012); 100 per cent of people live in urban areas. The population growth rate stood at 2.6 per cent p.a. between the years of 1990 and 2012. In 2012 the birth rate was ten per 1,000 people (23 in 1970) and life expectancy was 82 years (69 in 1970). The population is predominantly Chinese (77 per cent in 2000 census), with Malays constituting 14 per cent and Indians eight per cent, and small minorities of Europeans and Eurasians. Singapore is classified as a high-income economy by the World Bank.